The hurricane hunter recon found a low center between the Cayman Islands and Honduras this afternoon. Winds are weak at this time, but a cyclonic turning is noted and further development is possible. 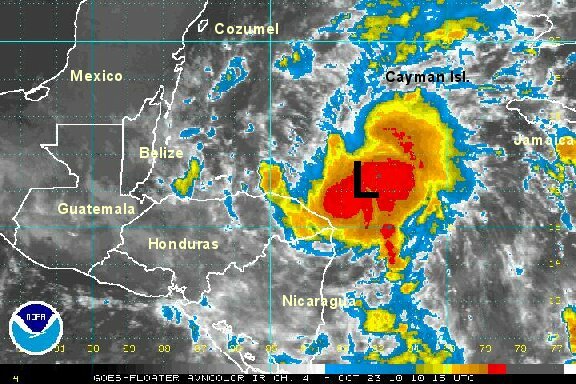 As of 5 pm edt tropical depression 19 was forming near 17.5° N / 83.6° W or about 200 miles southwest of Grand Cayman Island. Top sustained winds are estimated at 30 mph. Movement - nearly stationary. Pressure estimated at 1009 mb. Forecasts show weak steering currents over the next several days in the northwest Caribbean. We believe that the tropical disturbance is definitely a tropical depression now. A solid low level circulaton is apparent on even the I.R. satellite imagery. Deep convection is mostly east and northeast of the low center. The hurricane center is obviously waiting for the hurricane hunter recon before "they make the call" and classify td 19. It is interesting to note that wind shear is affecting the system and has pushed the deep convection from the low center. If the shear continues it will adversely diminish develpment chances. As of 7 am edt unofficial tropical depression 19 was centered near 18.0° N / 82.5° W or about 175 miles southwest of Grand Cayman Island. Top sustained winds are estimated at 30 mph. Movement - nearly stationary. Pressure estimated at 1008 mb. Upper air winds have pushed the deep convection east of the low center today. The most recent hurricane hunter recon found the pressure unchanged from yesterday. The low center is actually has a series of vorticies rotating around a common center. The appearance appears to be slightly more disorganized today even with the impressive area of showers and storms associated with it to the east. The heaviest storms are southeast of the Cayman Islands and west of Jamaica. Some stronger gusts are likely with the storms to the east of the low center. The hurricane center is still going "high chance of development". As of 5 pm edt the tropical disturbance was centered near 17.5° N / 81.8° W or about halfway between the coast of Honduras and Grand Cayman. Top sustained winds are estimated at 25 mph. Movement dritfing erratically. Pressure estimated at 1009 mb. Tropical depression 19 was classifed last night by the hurricane center as convection continued to increase. Wind shear is still an issue as the heavy showers and storms are on the edge of the low circulation. This however is an improvement in its structure compared to yesterday. It is likely that it will gain tropical storm strength later today if this trend continues. As of now the heaviest showers and storms are south southwest of Jamaica and have shifted well away from Grand Cayman. As of 7 am edt tropical depression 19 was centered near 17.0° N / 80.7° W or 160 miles sse of Grand Cayman / 215 miles from the coast of Honduras - Nicaragua. Top sustained winds are estimated at 35 mph (nhc 5 am advisory - 35 mph). Movement southeast 3 mph. Pressure estimated at 1005 mb. Forecasts show weak steering currents over the next few days in the northwest Caribbean. Beyond this, the subtropical ridge should develop resulting in a west or northwesterly direction. Forecast confidence in the track is not high beyond a couple of days at this point. The hurricane center will upgrade to tropical storm Richard soon. Deep convection is slowly building with Richard. An upper air trough to the northwest is still keeping the heavy showers and storms pushed to the eastern half of the storm. A buoy not far from the center is registering about 4-5 foot seas. NOAA is predicting seas up to 9 feet. That's possible in the stronger convection. As of 5 pm edt tropical storm Richard was centered near 16.0° N / 80.4° W or 235 miles sse of Grand Cayman / 200 miles from the coast of Honduras - Nicaragua. Top sustained winds are estimated at 40 mph (nhc 5 pm advisory - 40 mph). Movement south southeast 3 mph. Pressure estimated at 1005 mb. Forecasts are spread from taking Richard due west toward Nicaragua - Honduras to northwest into the Yucatan and possibly into the southern Gulf of Mexico by Monday. The hurricane center's official track is a compromise of these solutions leaning toward the more northern scenario. Even if Richard does take the more northern scenario, land will weaken it and shear should become more of a factor. We would like to see a couple more model runs to get a handle on which track will be more accurate. Right now with Richard drifting in the northwest Caribbean it's tough to discern. The central dense overcast or circulular cloud area with the tropical storm has grown overnight. It also appears that the cloud tops have been cooling over the past several hours indicating that strengthening has begun. Seas at a nearby buoy are up from 4 feet yesterday to 7 feet now. This also supports a strengthenng trend since the location of the storm has been nearly unchanged. The heaviest showers and storms remain over the open water of the Caribbean between Jamaica and the border of Honduras - Nicaragua. As of 7 am edt tropical storm Richard was centered near 16.0° N / 80.3° W or 235 miles sse of Grand Cayman / 205 miles from the coast of Honduras - Nicaragua. Top sustained winds are estimated at 50 mph (nhc 5 am advisory - 40 mph). Movement stationary. Pressure estimated at 1005 mb. Forecast models are now becoming more consolidated. The track takes Richard generally west close to the coast of Honduras by later Saturday or early Sunday then into Belize or southern Mexico just north of Belize by late Sunday into Monday. I have given ranges due to the differing model solutions. The strength of Richard will be highly dependent on landfall location. If Richard moves a little south of this track it will make landfall in Honduras / northern Nicaragua cutting its possible development time. If it stays far enough offshore and remains north of Honduras it will have a chance to strengthen more. With recently satellite imagery, we agree with the hurricane center that Richard has the potential to become a hurricane, especially if it stays north of Honduras. The overall appearance of Richard has not changed much today. Deep convection is still close to the center of circulation. Showers and storms are still over the open waters and not affecting land yet. Rain and wind will pick up on the Bay Islands and northern Honduras during Saturday. Locally heavy rain is likely with the potential of flash flooding. As of 5 pm edt tropical storm Richard was centered near 16.2° N / 81.7° W or 130 miles from the coast of Honduras - Nicaragua / 325 east of Roatan, Honduras. Top sustained winds are estimated at 50 mph (nhc 5 pm advisory - 45 mph). Movement west 5 mph. Pressure estimated at 1005 mb. Forecasts continue to take Richard west, then west northwest over the next couple of days. Richard will be near the northeastern coast of Honduras to 50 miles north of the coast Saturday. If Richard stays offshore, there is a chance for additional strengthening to hurricane strength. If it stays close to the coast, development will be inhibited. Richard will move more west northwest later tomorrow taking it toward the coast of Belize where it should make landfall by Sunday. Richard will weaken over the southern Yucatan peninsula Monday. 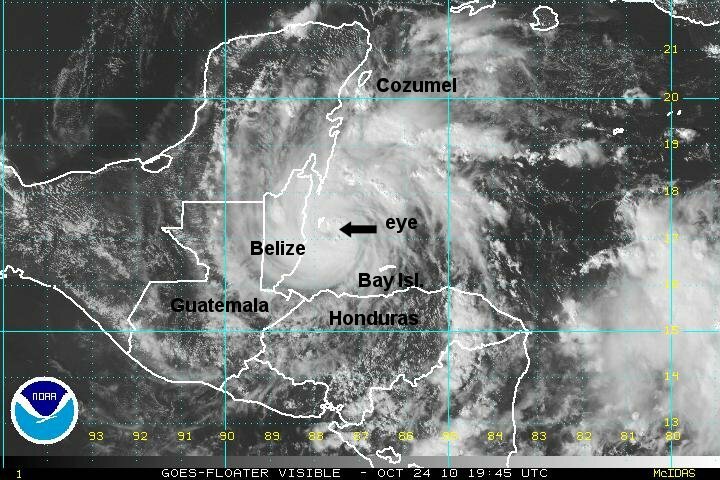 Interests in Honduras, Belize, and the southern Mexico Yucatan should follow the progress of Richard and complete storm preparedness as necessary. It appeared that tropical storm Richard weakened slightly several hours ago but has nearly regained its strength back. Deep convection is building again. 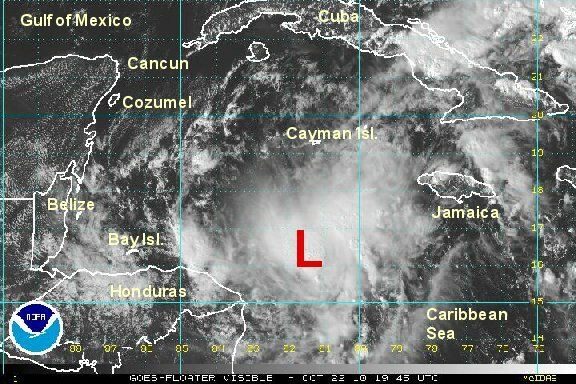 It is tough to locate the surface circulation with the I.R. imagery as also stated by the hurricane center earlier. The surface low may not be vertically stacked with the mid level meaning that Richard is still not that organzied. We are estimating the low center a little more northeast than nhc. Rain and wind will pick up on the Bay Islands and northern Honduras later today with some of the rain now reaching the northeast corner of Honduras. Locally heavy rain is likely with the potential of flash flooding. As of 7 am edt tropical storm Richard was centered near 16.0° N / 83.0° W or 60 miles northwest of the coast of Honduras - Nicaragua / 235 east of Roatan, Honduras. Top sustained winds are estimated at 45 mph (nhc 5 am advisory - 45 mph). Movement west 8 mph. Pressure estimated at 1005 mb. Richard will move more west northwest later tomorrow taking it toward the coast of Belize where it should make landfall by Sunday. Richard will weaken over the southern Yucatan peninsula Monday. The new hurricane center advisory just came in. They said Richard has reformed to the east. This would closely match our estimate from 7am In reality, the low most likely didn't reform. It was probably just not correctly interpreted on the I.R. satellite - a fairly easy thing to do. Richard has only strengthened slightly today. The hurricane center upped the winds early today when the recon found a strong flight level wind. Convection is not as impressive as it was earlier and we think the surface wind was more indicative of the 53 knot wind estimated by the recon this morning. So, the overall picture is that we think Richard is a little weaker than the offical estimate. 65 miles per hour also seems too high for a pressure as high as 1000 mb. Most of the rain remains offshore at this time. Rain and wind will pick up on the Bay Islands and northern Honduras into this evening with some of the rain now reaching the northeast corner of Honduras. Locally heavy rain is likely with the potential of flash flooding. As of 5 pm edt tropical storm Richard was centered near 16.1° N / 84.2° W or 175 miles east of La Ceiba, Honduras. Top sustained winds are estimated at 55 mph (nhc 5 pm advisory - 65 mph). Movement west 8 mph. Pressure estimated at 1000 mb. Ricahard is steadily heading for Belize and strengthening some. A hurricane hunter recon just came in to show a pressure now down to 990 mb. 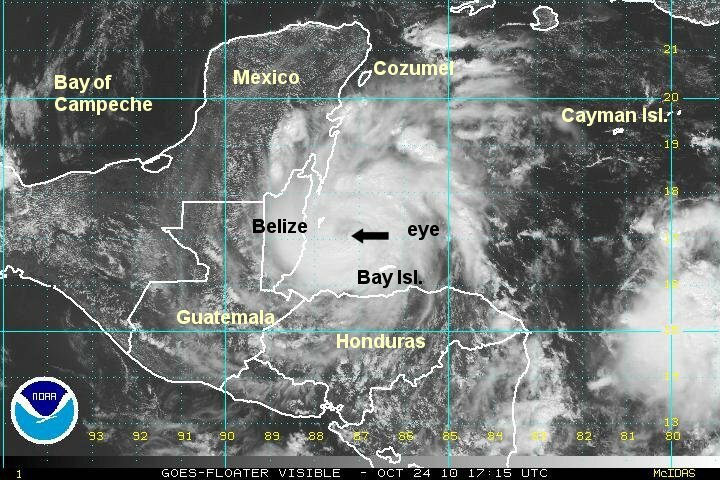 It is likely that Richard will make landfall as a minimal hurricane in Belize. The swath of heaviest rain will move into Belize, northern Guatemala and into the southern Yucatan peninsula over the next couple of days. Rainfall totals of 5 inches or more are possible along the path of Richard which could cause flash flooding. Richard is east northeast of Roatan at this time with wsw winds at 30 mph and heavy rain. Wind gusts are possibly in the 40-45 mph range. As of 8 am edt tropical storm Richard was centered near 16.8° N / 86.4° W or 25 miles east of Isla Guanaja, Honduras / 190 ese of Belize City, Belize. Top sustained winds are estimated at 70 mph (nhc 8 am advisory - 70 mph). Movement wnw 10 mph. Pressure estimated at 990 mb. Richard will make landfall in Belize by this evening and will weaken over the southern Yucatan peninsula Monday. It is possible that Richard will emerge in the Bay of Campeche by Tuesday, but is not likely to strengthen significantly. Richard appears to be starting a rapid deepening phase. Thankfully, it will make landfall soon limiting its development. A recon found a wind at 85 mph and it looks like an eye will be visible on the satellite soon. It is very possible that Richard will be a cat 2 hurricane on landfall. A complete update will be posted later today. Hurricane Richard is about 3-4 hours from landfall. It will move into Belize just south of Belize City meaning that the northern eyewall may actually pass over. 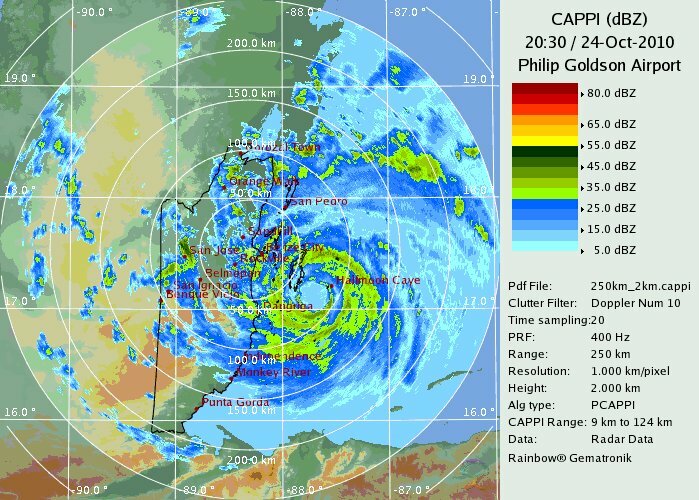 The eye has become briefly visible and shows and excellent presentation on the radar imagery. Richard will be a strong cat 1 or weak cat 2 hurricane on landfall. Offshore seas are predicted by NOAA at 24 feet under the eyewall. Heavy rainfall of 5 inches or more is possible in the path of Richard. Storm surge of 3-5 feet or higher are possible near and 25-50 miles north of the landfall location.....the central and northern coast of Belize. 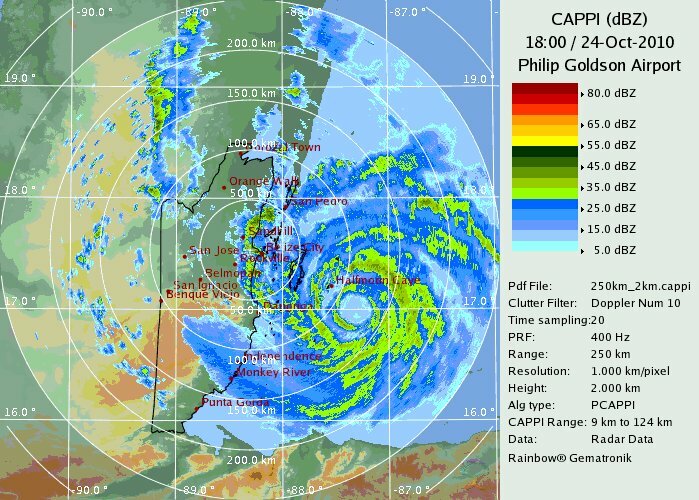 As of 3 pm edt / 2 pm cdt hurricane Richard was centered near 17.1° N / 87.5° W or 45 se of Belize City, Belize. Top sustained winds are estimated at 90 mph (nhc 1 pm cdt advisory - 85 mph). Movement wnw 10 mph. Pressure estimated at 988 mb. Richard is moving into Belize this evening and will continue into northern Guatemala / southern peninsula of Mexico tonight and Monday. It is possible that Richard will emerge in the Bay of Campeche by Tuesday, but is not likely to strengthen significantly. No change other than updated satellite and radar imagery. Pressure continues to drop as Richard strengthens just beofre landfall. The hurricane center "upped" their winds to match our estimate from a couple of hours ago. 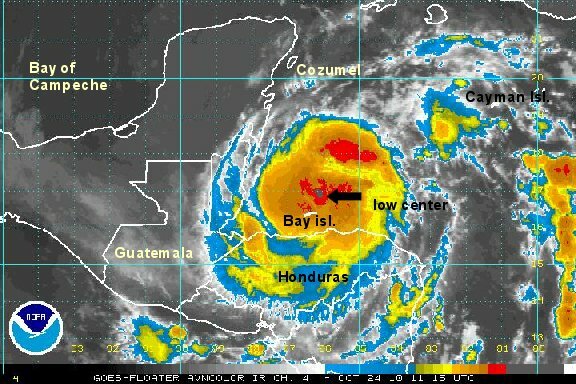 As of 5 pm edt / 4 pm cdt hurricane Richard was centered near 17.2° N / 88.0° W or 25 miles sse of Belize City, Belize. Top sustained winds are estimated at 90 mph (nhc 4 pm cdt advisory - 90 mph). Movement wnw 13 mph. Pressure estimated at 981 mb. Richard will be moving into Belize south of Belize City over the next few hours and will continue into northern Guatemala / southern peninsula of Mexico tonight and Monday. 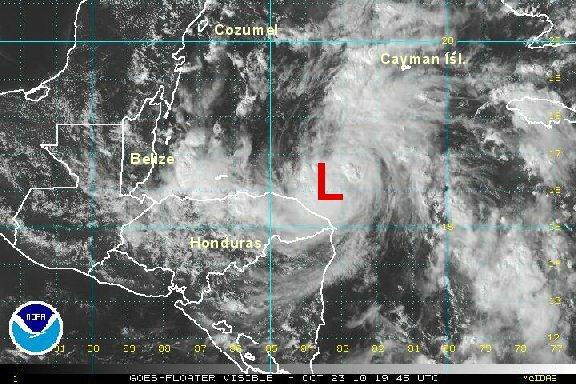 It is possible that Richard will emerge in the Bay of Campeche by Tuesday, but is not likely to strengthen significantly.